Ancient civilizations are emphasized in fifth grade. A survey of world history from Persia, Mesopotamia, Egypt, and Greece is explored through the myths, writings, art, and architecture from each time period. A study of these important early governments would not be complete without a study of our own current situation. Therefore, the 50 States and a basic study of American government forms yet another block of themes. Writing becomes the focus in literacy studies as children are taught the framework for writing research papers. Skills include improving voice, conventions, word choice, fluency, ideas, and organization. Math studies revolve around mastering decimals, percentages, and fractions. Of equal importance are the study of mixed numerals, ratios and proportion, and data collection and analysis through graphing techniques. Geometry is also introduced, along with the metric system. 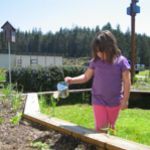 In science, inquiry based learning provides the framework for studies in botany, open oceans, states of matter, weather conditions, erosion, and irrigation. The main lesson format also allows for integration of science and geography throughout the year. Sixth grade studies are designed to inspire the intellect, stir the emotions, and harness the physical abilities of the young adolescent. Roman and medieval history is surveyed, as students study the fall of Troy, the Roman republic and empire, the advent of Christianity, The Crusades, and the rise of Islam. In science, astronomy, geology, mineralogy, and physics (acoustics, optics, thermal energy) are explored. Students learn to use compasses and rulers to create precise geometric forms, including hexagons, dodecagons, pentagons, and 24-sided polygons. In math, students deepen their knowledge of pre-algebra, algebra, business math, and geometry. The language arts focus during this year is writing for various purposes, including research, creative writing, and preparation for debates.